Today, the Gold Fifty-Cent Coin remembers when the Pan-American delegates returned to Washington on November 13, 1889, from their almost 6000-mile rail journey on a special train. Their Special Train Drawn by One Locomotive Six Thousand Miles. The Delegates Arrive at the Capital on Schedule Time Cheering and Thanking the Engineer. Washington, Nov. 14. The great tour of the Three Americas delegates through a part of the United States was concluded last night when its special train drew into the Baltimore and Potomac Railroad station at 6:40, and the promise of its managers that the same engineer who opened the throttle on the same spot forty-one days ago should shut off the steam of engine 1058 at the conclusion of the tour, was fulfilled. From the inception of the idea it had been agreed that the same cars should be used throughout the entire tour. They were the finest examples of the Pullman Company’s production, and were fitted up as living quarters for the party. Steam heat and electric light were used, and in order that the supply of heat and light should never fail, a locomotive fitted up for furnishing these useful commodities was necessary. Many roads were traversed where the motive power was not equal to this demand, and the only certain precaution against failure was the employment of one locomotive for the entire service. Such a thing has never been heard of before in the railway experience of the country. The locomotive and the entire train have traversed every foot of the 5825 miles, and came to a full stop in the station last night on the minute of the schedule apparently as fresh and as powerful as when It started out on the morning of October 3. The achievement is a signal event in railroad affairs. The members of the party soon found their way to the front entrance of the depot, where carriages were waiting, and they were at once driven to their rooms. The party, as it passed the big locomotive on its way out of the station, paused long enough to call Engineer Hart from his engine, and to give him three hearty cheers. Afterwards the members shook hands with Hart and bade him good bye. When the delegates to the International American Congress gathered at the Baltimore and Potomac Railroad Station in Washington, on the morning of October 3d, 1889, to begin their tour to the principal industrial cities of the United States, they found awaiting them a train of cars which has never been equaled in point of equipment on any similar occasion in the world. As it stood in the station ready to receive its distinguished passengers the train represented a money value of $150,000. In its composition it was as complete in all its appointments as a metropolitan hotel or club-house. There were drawing-rooms and parlors for use by day, berths and state-rooms for sleeping purposes, a library and writing-rooms, bath rooms and a barber’s saloon, a dining car perfect in every detail. Rich upholstery and magnificent drapery from the looms of the Union, stalwart oak from the forests of North America, glistening rosewood from the banks of the Amazon, mirror-like mahogany from the sunny lands of Central America, and velvety satinwood from the valleys of the Himalayas had all been brought into requisition by the decorator and finisher. From the spoils of so many climes the car-builder had constructed the train whose elegance, comfort, and luxury a fairy prince might covet. The Composition Of The Train. At the head of this princely train there stood Pennsylvania Railroad locomotive No. 1053. This engine is known in the technical classification of the builders as “Class O.” It was designed by Mr. Theo. N. Ely, General Superintendent of Motive Power, built at the Pennsylvania Railroad’s car and locomotive shops at Altoona, Pa., and is a type of the best American effort in locomotive construction. The total weight of the engine is ninety-one thousand nine hundred pounds. It is a very handsome, as well as a perfect, piece of mechanism, and its capacity for constant, unbroken, and speedy work has been demonstrated by its performances on this tour to be superior to any previous achievement of any other locomotive in the world. The run of three hundred and twenty-five miles, between Milwaukee and St. Paul, in ten hours, and that of four hundred and seventy-six miles, between Omaha and St. Louis, in eighteen hours, establishes its staying powers on a firm foundation, and makes for it a record that is matchless in the railroad history of this country. The use of a single engine for a trip of over five thousand miles has never before been attempted, and the brilliant success which marks this case is eloquent proof of the accomplished skill of American mechanics, as well as a convincing demonstration of the excellence of American railroads. Following the engine is the Pullman Vestibule Composite Car “Esperanza.” This is the technical designation’ of the car in railroad parlance, but it is more properly and intelligently described as a library and smoking car. The front portion of this car is used as a storage van for the baggage, with a section reserved for the dynamo. This dynamo, operated by steam supplied from the locomotive, furnishes the power for illuminating the entire train. From it the storage batteries, placed under the cars, are charged with electricity, sufficient in amount to thoroughly illuminate all the cars for ten hours, without recharging. It also supplies the current for the movable berth lights and the signal lights on the end of the rear coach. Adjoining the baggage compartment is the bath and barber’s saloon. The bath-room is supplied with both hot and cold water, and the shaving and hairdressing department is complete in all its details. A buffet, for the service of light refreshments, comes next, and beyond this is the open parlor for smoking, reading, or writing. An escritoire, with writing materials, and a bookcase filled with entertaining volumes are striking features of the smoker’s paradise. The interior is finished in oak, and the prevailing colors of drapery and decoration are bronze and gold. Luxurious bamboo arm-chairs and a sofa invite ease and comfort. A Refectory In Oak And Olive. Next in order is the Pullman Vestibule Dining Car “Windsor.” This car is used exclusively for the preparation and service of meals. The kitchen occupies about one-third of the interior space, but it is so arranged and separated from the main saloon that no odors of the cooking are allowed to penetrate the dining-hall. A chef and four assistants preside over the range, and five white-jacketed waiters perform the bidding of the guests. There are store-rooms chilled by cold air, refrigerating wine closets, linen lockers, plate and china chests, and all the conveniences requisite for the providing, preparing, and serving of bounteous meals. has charge of this car. The Pullman Vestibule Drawing and State Room Sleeping Cars “Washington,” “Columbus,” “India,” and “Japan,” are each the largest cars of their class, and the most notable specimens of the Pullman Palace Car Company’s skill. They are seventy-five feet long, fourteen feet high, and contain twelve sections of two double berths, a single and a double drawing-room, beside lavatories, a bath and toilet rooms. The “Washington” and “Columbus” are finished in satin wood and mahogany. The upholstery is imperial purple, and the curtains are maroon. The “India” and “Japan” are finished in like manner, but the distinctive tints of upholstery and drapery are turquoise blue, garnet, purple, and maroon. The drawing-rooms, or private compartments, are separated from the main saloon by partitions of hard wood. Their interior finishing is of ivory and gold, with rich maroon hangings. Private lavatories and toilet-rooms are connected with the drawing-rooms by communicating doors. The baths and lavatories throughout the train are supplied, from tanks placed beneath the cars, with both hot and cold water, which is forced into bath-tub or basin by air pressure. Radiant nickel chandeliers hang from the roof ridge. They are fitted for gas or electricity, but the latter is the generally accepted illuminating agent. In addition to the chandeliers, movable electric bulbs are fitted in each berth, so that one may dispose his light to suit his convenience. The vestibule attachments connecting the different cars render the train, as far as the passage from car to car is concerned, one elongated coach. A passenger may pass through the entire train with the same facility as if he were strolling through a long corridor. Steam from the locomotive is distributed through radiators placed in the cars, so that a uniform degree of heat can be maintained throughout the entire train. All the cars of this train were withdrawn, for the time being, from the regular equipment of the “Pennsylvania Limited,” which runs between New York and Chicago every day, and the locomotive for months previous to the tour had been in constant service, drawing the heaviest passenger trains over the high grades of the Allegheny Mountains. Few railroads in the world could provide so complete a train from its every-day service. All the preliminary arrangements for the tour were undertaken for the United States Government by the Pennsylvania Railroad Company, through its personally-conducted Tourist System. The undertaking involved an enormous amount of detail. Every provision for the movement of the train was perfected in advance, and the entire plan and scope of the tour was reduced to a printed itinerary before the distinguished party started from Washington. This work required weeks of earnest, persistent, and careful endeavor, and the efficiency of the System is amply demonstrated by the fact that the programme has not been changed in any essential point since the tour began. The delegates to the International American Conference have seen the sources of the power of a great people, yet, when they come to sum up the results of the trip, the fact should not be ignored that they have themselves promoted and have witnessed the accomplishment of the greatest achievement of modern railroading. 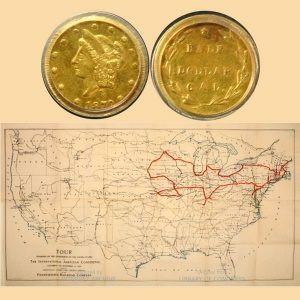 The Gold Fifty-Cent Coin shows with an image of a map with the tour outlined in red, circa 1889.